Comedy Masala ft. JOANNE KAM - Malaysia's Queen of Comedy | One-Night Only Performance in Singapore! Standing tickets will be avail at the door from 7pm onwards. Malaysia's MOST ICONIC female comedian will headline Comedy Masala in a special ONE-NIGHT ONLY performance in Singapore!! The emancipation of Joanne Kam into the entertainment industry in the 90s, turned around and introduced a whole new meaning of comedy in the conservative night scene of Kuala Lumpur, Malaysia. The explosion of her talent on stage also catapulted the success of Kuala Lumpur’s first cabaret club called the Boom Boom Room. Boom Boom Room quickly became the Studio 54 of Kuala Lumpur with Joanne Kam, reigning as its risqué mistress, dishing out her scandalous jokes to her ocean of eager fans that commuted weekly to pay tribute to the “Diva Queen”. Kuala Lumpur was never the same again. 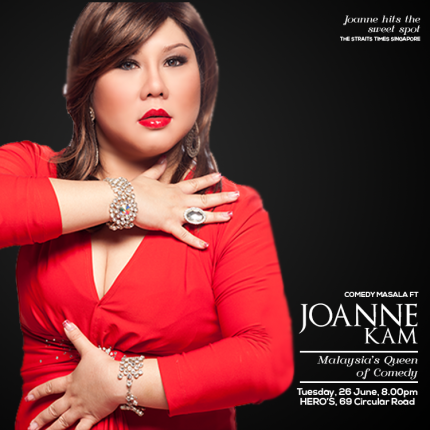 Joanne’s distinct style of acid tongue humour earned her the reputation of being one of the most notoriously funny ladies on Malaysian stage. The audience just couldn’t get enough of her candid, risqué jokes. Her outfits too were a statement of their own, tight fitting sequins gowns with plunging necklines that accent uated Joanne’s full ample assets. Her style created a revolution and confidence booster for women of all shapes and sizes who started idolizing her for her daring fashion sense. Bigger-sized females in Kuala Lumpur began showing off their ample curves instead of covering up in sacks and having as much fun as their skinny counterparts. Kuala Lumpur was shocked and in awe, and fell head over heels for this bawdy, voluptuous comedian.